Sing-along, interactive music designed for a child's introduction to the sounds and words of Spanish, English, French or all three! It's simple. It's repetitive. Mostly, it seems like fun and playful music, and then suddenly you're speaking a new language! Lyrics are all based on the concept of transferrable language, so that you learn to say relevant phrases and sentences that are readily adoptable into daily speech patterns; all lyrics are presented in an immersion style, and all of our singers are native speakers. 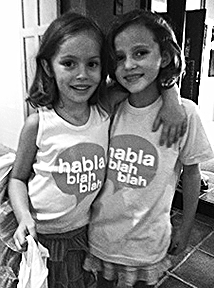 Young children have a natural ability to acquire a second language concurrently with their native tongue. Language learning stimulates creativity, supports oracy, literacy, and leads to gains across the curriculum (and test scores! ), as students learn alongside their teachers. Use this handy QuickTime Movie as a guide or download the PDF here. Listen to the music selection in your mother tongue, then switch to the album with a new language. The lyrics are the same across all albums but sung in the three different languages, while the musical compositions remain identical in each. Your brain will make connections based on rhythm, tone, and familiarity even before you read the enclosed lyric booklets. Decoding new words and phrases will start before you read the translations! Have fun, sing along, and try it… before you know it you may be asking in French, "Where is the bathroom? ", or in Spanish, "Do you want to play? ", or telling your friend in English to "Give me five!" Coming soon.... downloadable coloring sheets to correlate with all of our songs. Listen to the music (for instance, JUMP) as you color the subject matter (for example, a frog), and passive learning happens before your eyes! “We have been working with the HBB program for some months. Kids love to watch all the videos, especially videos with people, be it children or adults. They are very interested in seeing people interact, since they normally only watch animations and cartoons. I have noticed an increase in vocabulary when watching the videos and they get certain words stuck in their heads and like to repeat them during the day! No matter the language in which they listen to the songs, they are always very entertained and easily repeat the vocabulary.